Discussion in 'Frontier and Player Outposts' started by Kaizimir, May 18, 2014. The People of Carthaga (PoC) are an open, non-profit community. make sure everybody enjoys their stay. Please also visit our web page and follow us on twitter. Carthaga is always looking for dedicated members that want to take up responsibility for the city and community. Living in the wilderness is a special way of playing, are you made for it? Please apply using the Application form below and post it in this thread. We will respond and send you the Starter's guide. For questions or assistance you can contact Kaizimir or one of our members. Please find a complete member list on our web page. Please answer these questions honestly. You will hear from us! A mission of PoC is to be involved in ongoing projects on EMC and send resources, specialists and Rupees to these projects and thereby creating great things. Contact us if you know a project that can use support. We will handle your request ASAP. We prefer to support public projects, but can cut deals for malls and other commercial projects. For a complete list of projects, please see our Project support page. You love architecture, you are a lucky miner or a slick diplomat? Make use of Carthaga's power to create monumental builds, find the rarest ores, or make historic pacts with our allies. PoC will be grateful and never forget their great leaders. By finishing jobs you receive points, rank up and gain extra perks. Higher ranks get their own working area, can post jobs and employ other members. Rules for Jobs and Rankings can be found on our Job system page. 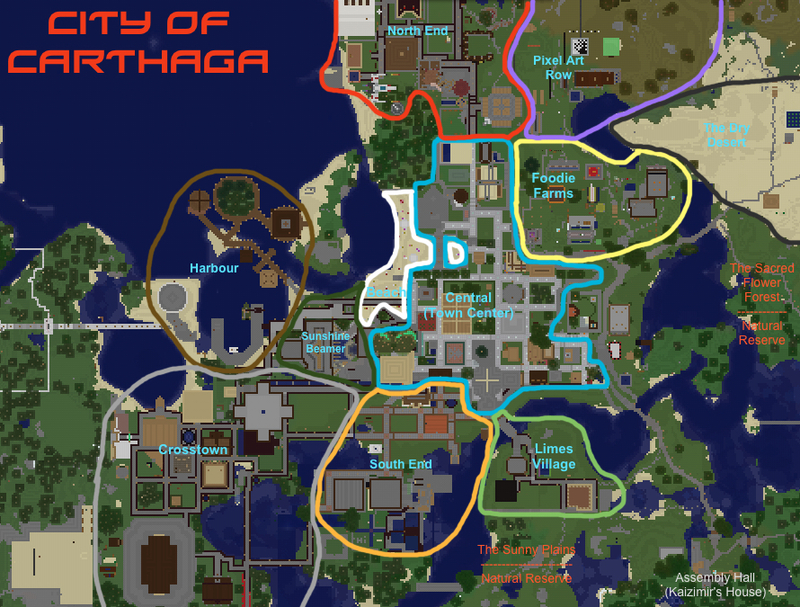 These guidelines help us to keep Carthaga a peaceful and safe place. Please respect them, when visiting. All builds, chests, animals and other items belong to their owners. Builds can be put anywhere, but must be outside natural reserves. 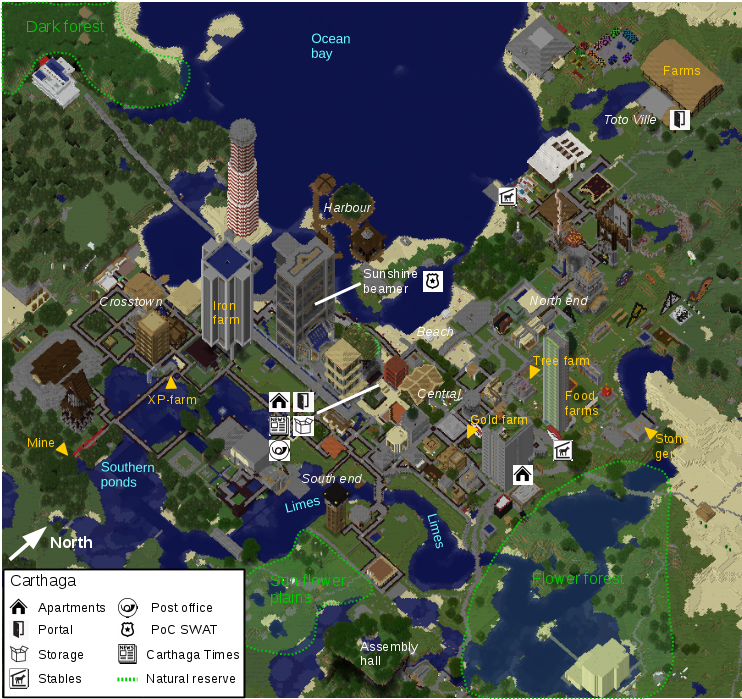 Mining and gathering of resources is allowed in designated areas and 300 blocks away from Carthaga. Outposts are fairly to very safe and must be maintained to stay this way. These are not for personal gain or stocking of shops. Community storage only works if we stock it. If a structure got severely damaged, the Founders have to be informed immediately. Derelict on EMC = derelict in Carthaga. Tigerstar, gladranger7, Acemox2k and 27 others like this. And a collection of screenshots. Zikko, xXassasin360Xx, SEPTHEKID and 11 others like this. Please consult below whenever you feel like you need something to do, get your pals together and claim a mission. The roofed forest north of Carthaga needs protection and marking as natural reserve. It should become clear that this is not a building area. For an example, please look at the flower forest or sunflower plains. Right now it is hard for Carthaga to get hold of gunpowder, therefore we need a mob grinder. Please locate in the industrial district at the iron and sea temple farm. This is the ideal spot for a new apartment building. It should look nice and inviting and have rooms for many new members. 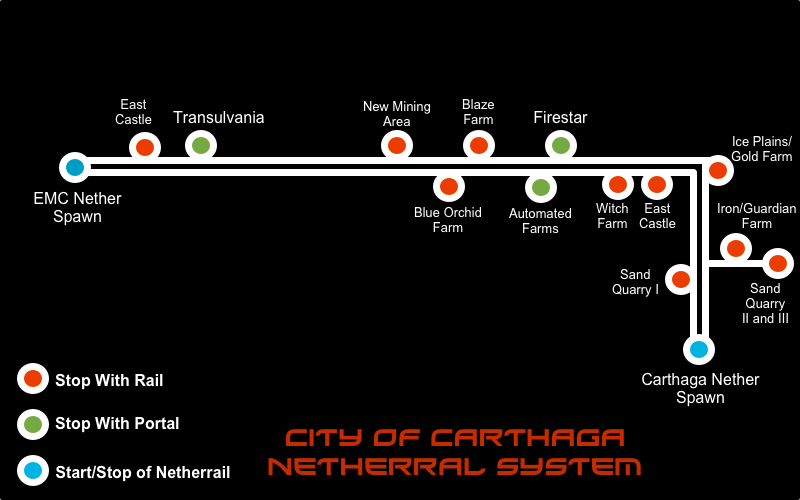 Build a whither farm or refine the one that is located close to the Netherrail station in Carthaga. If building a new one please consult with Suriyakeng, he knows an excellent spot already. This is a huge undertaking and you can count on all the support of PoC. AFK at the old gold farm, below the city centre and the new gold farm at the ice plains for 3x1 hour each and count the number of nuggets collected. Scientific precision required!! It would be nice to have a list of all the farms around Carthaga with type and location. If you want to do more, assess the output of items per hour. If you would like to take over a mission, please consider the requires skills and time needed to finish it. When you think, you can finish a mission and want to claim it post a note in the thread. It is always possible that a mission cannot be finished for some reason. In that case, please give it free by making a note in the thread. Team up! Doing a mission in a reasonable sized team will be much quicker and more fun. Points are per team player! If you know of a project that needs support let Kaizimir or the committee know. If you have a question or are uncertain about a mission contact us. caden672, Rainbowpony1000, SEPTHEKID and 5 others like this. Thanks for all the help Carthaga has received from many. mba2012, Philovanrood, AshBlue789 and 7 others like this. Are you talking about making rails for fire star into the mines and making that outpost better? Also beacons buy beacons for the outpost. There is now a path leading through the 'Sacred flower forest' going around the big lake (name suggestions??). Please be aware that the flower forests have received the status of nature reserve and should be entered during day time only to ensure the protection of the landscape and rare specimens. The center square (name suggestions??) so far only holds the announcement board. Please give some input on what you would like to see at this public spot. Also note, new projects have been announced in the second post after the OP. 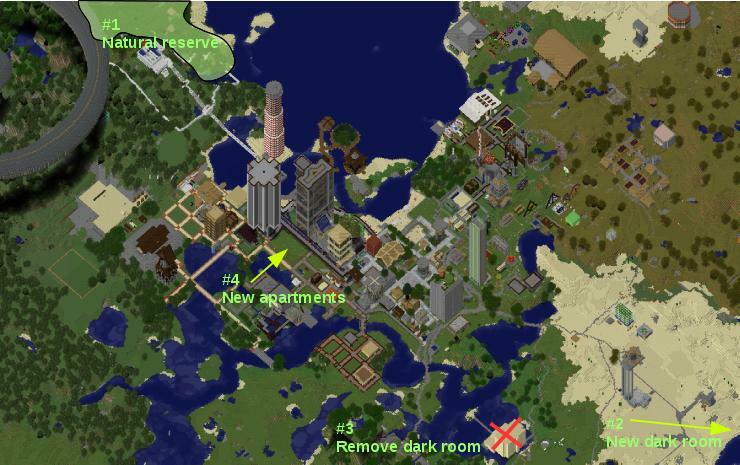 The squid farm is planned east of the Watch tower and the simple tree farm we have now is going to be replaced by an automatic redstone tree farm. Materials for this will be shipped soon. caden672, CaziCookie and Scorpio528 like this. We will be expanding south by clearing out the Birch Forest so . Also we are really excited when new people join so, Join! Alright, the outpost is coming along greatly! 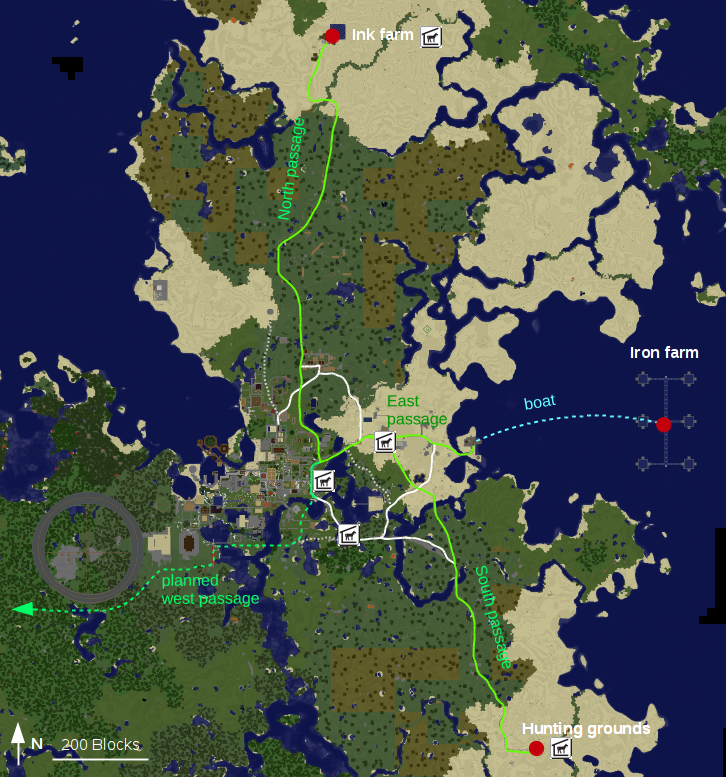 Today I will start the redstone tree farm and the next flower farm. Hooray to PoC! gladranger7 and CaziCookie like this. I already put a gate in the southern part of the town wall to access this area. CaziCookie and Scorpio528 like this. The redstone wood farm is done! Nice Notch Great job on such short notice! I'm thinking grinder maybe 8-10 lol. Yes, that should be good as well. Btw, whats with the sea side grinder close to your house? Two marlixes and a momentus at the outpost today. Me and crafter got the momentus together and the marlixes randomly died whilst fighting me. CaziCookie and miner3808 like this. how often do they spawn ?